Chandigarh 12th October 2008: The connoisseurs of fashion and Jewellery PC Jewellers (PCJ) held an exquisite Gold Jewellery Exhibition, at their showroom in Panchkula. The exhibition began with launch of new range of Jewellery, The star collection was inaugurated by TV superstar Shveta Salve. Well attended by socialites and bigwigs the event is the talk of the town. Shveta’s sparkling presence and winning smile further brightened the glittering occasion. A Fashion show was organized, where glamorous models displayed rare and exotic Jewellery designs. PCJ offers more than 10000 exotic designs. PC Jewellers is one of the largest and most reputed chains of gold jewellery that provides a wide range of products, transparency in dealings and best customer care. Moreover, there is a dedicated team for ongoing creation of designs according to taste and need of customers. On the occasion Mr Balram Garg, Managing Director of PC Jewellers, said that “The Exhibition celebrates the spirit of creativity and craftsmanship”. He further added that PCJ aims to provide jewellery products according to the need of every occasion at the most competitive prices. PC Jewellers fulfills the increasing need in India for contemporary, versatile pieces of jewellery while giving our customers an insight of the emerging global trends. We are better known for our quality & hallmark jewellery. Every year we plan out something more unique to keep the excitement levels high. ‘Shringaar ’ will highlight some of the most exquisite bridal and festival creations in diamonds, platinum, gold, silver, gems and pearls. Star of the occasion appeared thrilled to be a part of this glam event and said, ”PCJ is famous as a brand that embodies beauty, elegance, and style, their designs are highly sophisticated and unique in their appeal.I think the spirit of celebration is the driving force behind such excellence. I can see a lot of beautiful piece of well-crafted jewellery. Their new range of jewellery launched today is simply amazing; it can delight the most discerning customers”. PCJ is a brand that embodies perfection in everything they do – be it jewellery or design. It is a brand that would match your needs at every occasion. 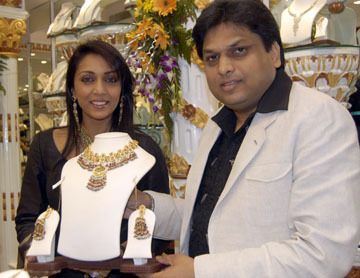 PCJ diversified ventures covers jewellery exports, premium garments, retail, whole sale of saree, real estate and more. What’s more they have also proven their mettle in being pioneers of incomparable quality in gold jewellery, garments and township projects. PC values the trust reposed in by the customers and is committed to uphold it at all cost. The most valued asset is relationship with the clients, which has been built over years by giving certified quality, latest designs, transparency in dealings and best personalized customer service, providing guidance to its customers to enable them to take correct purchase decisions. The visionaries behind PCJ are Mr. Padam Chand Garg, Mr. Amar Chand Garg and Mr. Balram Garg, who planted the sapling of the Kalpavriksha (Sapling of the giant tree), called PCJ Group. The company has its flagship showroom in Karol Bagh, Delhi and other showrooms in Noida , Panchkula PCJ has launched on 2nd Oct a new showroom at Faridabad and plans to open another showroom in the current month itself at Dehradun.. The company aims at opening further showrooms in different parts of the country very rapidly. By the end of year 08-09, total numbers of showrooms are likely to be double digit. All PC Jewellers’ showrooms are located in the premium locations and symbolize excellence in design, ambience, features and service. PCJ provides 100% hallmark jewellery and Certified Diamond jewellery. With strong brand values like long term vision, strategic planning, culture of excellence, core values, customized approach, resourcefulness, process agility and unwavering commitment to quality; PC Jewellers promises you a lifetime experience.